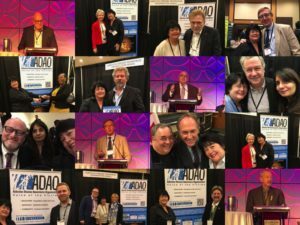 The Asbestos Disease Awareness Organization (ADAO) was joined delegates from around the world at the 14th International Mesothelioma Interest Group (iMiG) Conference, May 2-5 in Ottawa, Canada. They have attended and presented at seven iMig conferences across the globe including Chicago, Amsterdam, Kyoto, Boston, United Kingdom, South Africa and now Canada. As reported by iMig, the conference brought together nearly 450 delegates and 100 poster presentations from around the world for four educational days in Ottawa. The meeting offered plenty of networking opportunities with leading scientists, researchers, friends and colleagues, and featured the most up-to-date research, diverse topics of interest, and educational sessions with leading experts. On Friday ADAO President/CEO and Co-Founder, Linda Reinstein, presented fourteen years of experience in the session“Mesothelioma Advocacy in the 21st Century”. She discussed data from two ADAO patient and physician advocacy surveys and storytelling, which touched on the three asbestos waves, research to improve advocacy, and the power of strategic grassroots storytelling. One of the strongest and most informative sessions was “Plenary Session 03 – Asbestos Control Perspectives: Before the Ban, the Ban, after the Ban” where Eric Jonckheere, Peter Tighe, Bob Blakely, Alec Farquhar, Guillermo Villamizar, and Liane Murphy spoke. Lastly, there was a powerful Canadian National Asbestos Strategy Meeting prior to the start of the iMig conference which convened more than 50 people who represented asbestos victims/family representatives, labor movements, researchers and health professionals, public health and environmental groups, and asbestos activists from Australia, Canada, and the United States. iMig continues to carry the torch of hope for new treatments and ultimately, a cure for mesothelioma. The 2020 conference will be in Brisbane, Australia and everyone is invited! This entry was posted in Blog and tagged 2018 iMig, ADAO, Asbestos Disease Awareness Organization, Canada, Canadian National Asbestos Strategy Meeting, iMig, iMig 2020, International Mesothelioma Interest Group, Linda Reinstein, mesothelioma, Mesothelioma Advocacy, Ottawa. Bookmark the permalink.